Before I started on GAPS I ate yogurt but not because I loved or craved it. I ate it more out of convenience – something relatively healthy plus quick to eat – and my favorite was FAGE (pronounced “fa-yeh”). It is thick and delicious. Of course now I probably wouldn't eat it since I would want to avoid pasteurized milk. Many clinicians find removing casein, the protein molecule in all forms of dairy, is also integral to thyroid health. There is not as much research on casein intolerance as there is on gluten intolerance, however anecdotal evidence strongly suggests a diet that is not only gluten-free but also dairy-free promises the best results in managing Hashimoto’s. (p. 32). Morgan James Publishing. Kindle Edition. Since I have both the genetic mutation and Hashimoto's antibodies, it is probably best that I stay off dairy products. I've been missing yogurt though, and I have been slacking on getting plenty of probiotic foods in my diet. I bought a bottle of non-dairy yogurt starter in April 2011 and have not used very much of it. The site says you can freeze the product for up to one year, but I have had mine refrigerated and then frozen for two years. The good news is it is still making great yogurt for me! It has been such a treat to have yogurt again! I have made several batches and as is common with yogurt the longer it cultures the more sour. I cultured one batch 15 hours and it still had a sweet taste to it, while the 24 hour batch is much more sour and hardly sweet at all. It is delicious and I have been limiting myself to one cup a day. I recently got a new yogurt maker through a Groupon deal and I happened to have $20 in Groupon credits, so I was able to get my new yogurt maker for only $5. I have another yogurt maker that makes one quart at a time, but I wanted to try the little jars method to see how that would work out for me. Place coconut milk in a pan and heat until warm enough that the milk is smooth. Natural Value has no guar gum or preservatives and it is pretty clumpy straight from the can. This one that I linked to is also organic, and in a BPA-free can. I link to Amazon so you can see what kind I use, but I order from Azure Standard for a better price. In a small bowl add 1/2 cup of the warm coconut milk and 2 teaspoons to 2 tablespoons of powdered gelatin [affiliate link]. I linked to the brand I use, but it in capsule form. My bottle is powder, no capsules. In a small bowl place 1/8 teaspoon yogurt starter and a teaspoon of coconut milk. Mix well. I use the back of the spoon to mash and mix as the starter clumps. Mix gelatin, yogurt starter and coconut milk together in a bowl. Separate into individual jars, or place in your quart yogurt maker. Once the mixture is heated after a few hours, I stir to make sure everything is mixed together well. Let the yogurt culture from 15 to 24 hours. Remove from the yogurt maker and stir before placing in the refrigerator. It will separate with thicker yogurt at the top and water at the bottom. Mix while it is still warm and it will hold together once refrigerated. For the super thick yogurt I blended it with my hand mixer so that it would have a creamy texture. If you use 2 teaspoons, it will be fairly thin, while with two tablespoons it will be super thick. For the photo, I garnished the super thick yogurt with Whole Foods brand 365 Everyday Value Freeze Dried Tropical Fruit Blend which contains mango, banana, strawberry and pineapple. 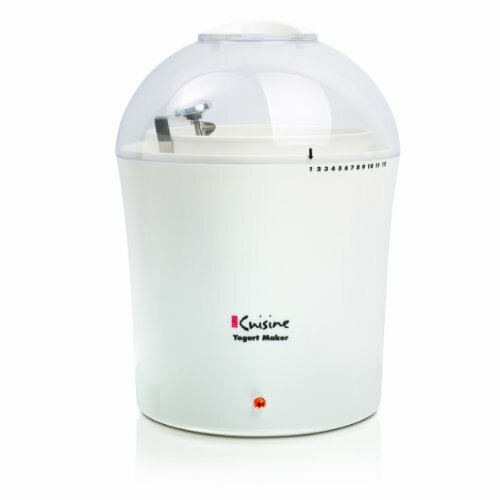 I use a yogurt maker that I bought at least two decades ago and looks similar to this one (clicking on the image takes you to the product; this is my Amazon affiliate link). I like making one quart in the same container. 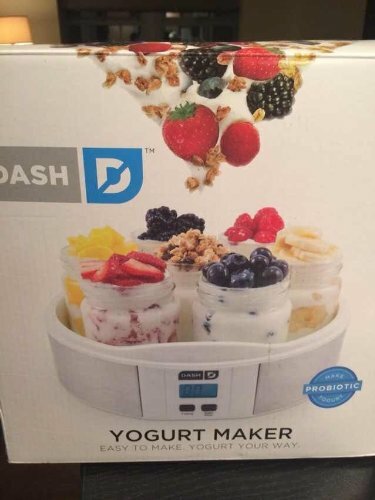 This is the yogurt maker I got through Groupon, the brand name is Dash(clicking on the image takes you to the product; this is my Amazon affiliate link). Sometimes I'll use this product but I tend to lose either jars or lids so I like the quart container better. I would love to hear from you in the comments on whether you have tried coconut milk yogurt, or if you are planning to try it. Coconut milk yogurt, rich and creamy. In a small bowl add ½ cup of the warm coconut milk and 2 teaspoons to 2 tablespoons of powdered gelatin. I linked to the brand I use, but it in capsule form. My bottle is powder, no capsules. In a small bowl place ⅛ teaspoon yogurt starter and a teaspoon of coconut milk. I am wondering how you would make this yogurt if you do not have an actual yogurt maker…? I buy frozen young coconut meat and make thick creamy coconut yogurt from that. I make my own coconut milk and add about 1.5 c to about 2 c of young coconut meat. I thaw the meat and then blend it with the milk and then I add the starter and put it in my dehydrator for 16 h. I love it! It has the texture of thick dairy yogurt unlike the yogurt made from the milk. I could never get the amount of gelatin right and it would not turn out. This works way better for me. I blend half a cup with a cup of frozen berries and 1/2 t honey and it makes a great breakfast! Isabelle, this sounds great. First of all, where do you buy frozen young coconut meat? Do you make the coconut milk using the young coconut meat? I’m curious to try this method, thanks for letting me know! I make coconut milk from shredded dried coconut and water. 1/2 c coconut to 1 c hot water. Blend and strain. I add 1.5 c of this to one thawed bag of coconut meat. Canadians can buy the same young coconut meat from Organic Lives which ships to health food stores like Choices and Nature’s Fare. I thaw 2 bags at once and it makes 7 c of yogurt. Isabelle, thank you for these instructions, I am going to try and get some of the coconut meat and try this out soon! Thanks! This is how I normally make yogurt- do you think this would work for the coconut yogurt? Is there a suggested temp to keep it at while it incubates? I don’t have a yogurt maker so I am putting it in the oven with the oven light on. The thermometer in the oven reads about 200. Fingers crossed, I just made my first batch. I used two cans of coconut milk I bought on Amazon that have guar gum in them (didn’t realize until I received them already) and it was pretty loose, so I added some coconut cream that I had on hand. My only concern is that the gelatin seemed to clump up even though I worked very hard to get it to blend. So there are little clumps in the mixture now. I am hoping it doesn’t mess up the yogurt. Thanks for sharing! Hello! Thanks for the great recipe! I was wondering if I could use actual yogurt (unflavored) for the starter instead of a yogurt starter (only because I have that on hand). If so, how much do you think I should use? Thanks so much! How do you know it worked? I just got done taking the jar out of the yogurt maker and stirring. I tasted the spoon and it just tastes like coconut milk. How do do you know that you actually have cultured yogurt rather than just thickened with getlatin coconut milk that was heated for a long time? Hi Nancy, if your coconut milk cultured it will taste just like yogurt. It should have a sour taste to it. Mine did and I was surprised how happy I was to taste that old familiar yogurt taste again. Does yours not have a yogurt taste to it? No. It just tasted like warm coconut milk. Wonder why it didn’t work. Used GI Prostart. Will have to try it again at some point. I make my own coconut milk. I wonder if it’s still edible as just thickened coconut/gelatin milk or if it’s not safe to eat. Nancy, I personally would probably use it. How much of the yogurt starter did you use? How much coconut milk? Maybe we can sort out what happened. Not wanting to risk a quart of coconut milk, I just made a pint and used 1/16th of a teaspoon of starter. The container says 1/8 teaspoon for 2 quarts, but you can’t get much less than 1/16th. I’m sorry your yogurt didn’t turn out. Is your product new? How do you store it? I wonder if it may have lost its potency? filler product. What I think happens is some of the bacteria may die off but some remain viable. So I wonder if you used 1/8th teaspoon if there might be enough live bacteria to ferment the coconut yogurt? Also – I had a conversation with customer service at Cultures for Health and she said I was lucky that my recipe turned out because they recommend the use of some sugar. Let me paste in our conversation and maybe you could trying using just a wee bit of sugar if you want to try again. “That’s fabulous if it’s working for you! The sugar is suggested because it aids in fermentation, since alternative milks do not contain as much sugar as a dairy milk would. However, if yours is fermenting just fine, don’t add it! So… maybe you could try 1.5 to 2 teaspoons sugar per cup of coconut milk. Would you be able to try the sugar? I have heard that we shouldn’t use honey since it’s antibacterial. The bacteria *should* eat all of the sugar. Nope. Sugar is out for us. I had emailed the people at GI Prostart and was told that some people are successful without sugar. But can’t for the life of me find where that email went. I know I got cashew yogurt to ferment, but after the initial positive response from my daughter, she decided she really didn’t care for it. Hey Starlene, it worked! Tried another batch last night. On the first batch, I didn’t realize the importance of mixing the probiotic in with a bit of warm coconut milk before adding into the larger batch. When I took it out of the yogurt maker this morning and gave it a stir, it had the yogurt tanginess. Yay! So now we’ve got two new snack items, the coconut milk yogurt as well as coconut milk pudding. Nice!!! I think the next time I make coconut milk into just the pudding (from just adding gelatin), I’m going to try giving it some vanilla flavor by scraping out a vanilla bean and blending it with the coconut milk. We are also anti candida, otherwise sky would be the limit with adding flavors. Yay! So glad to hear that you figured out what to do to make it work out! I love the coconut milk pudding idea too! I was wondering if you could use the actual coconut yogurt for the starter of the second batch. Or do you have to use culture GI Pro start every time. Hi Starlene, I have made my own dairy yogurt but having gone dairy free have missed that texture and of course the good bugs! One question about heating the coconut milk – There are some sites that recommend heating to 180 to kill a particular bacteria that can be in coconut (Burkholderia cocovenenans). What is your experience with heating only to 110? Any issues? I will be feeding this to my toddler so just want to make sure we dont have any issues. 🙂 Thank you! The recipe looks delicious can’t wait to try it. I am so excited to try this! Can you tell me which yogurt maker you like? I will have to buy one to make this. Thanks!! Hi, Starlene. I was finally able to purchase everything and turns out… my new yogurt maker is broken. But they’re sending me a new one. I can’t wait for this to work for our family, but I have a few questions. I mixed everything up before knowing my yogurt maker was broken and I ran into problems stirring in the gelatin. It was clumpy. I used the Great Lakes red gelatin and it didn’t mix well. Are there tricks? I heated the coconut milk (Native Forest Organic) on the stove to warm and pulled out the 1/2 cup and added it to the bowl with the measured gelatin of 2 Tbsp. It immediately was clumpy and I couldn’t get the lumps out. Any tips are greatly appreciated. Thank you! I tried this but had problems getting the gelatin to mix well without clumps. Any tips? Do you need to add the gelatin a tiny bit at a time? We eat a lot of yogurt since it’s so healthy and my euro cuisine is being used a lot. I’ve recently bought it because my old Cuisinart broke down. Thanks again for the great site! Love it!